Hello readers. I am back with a product review today. 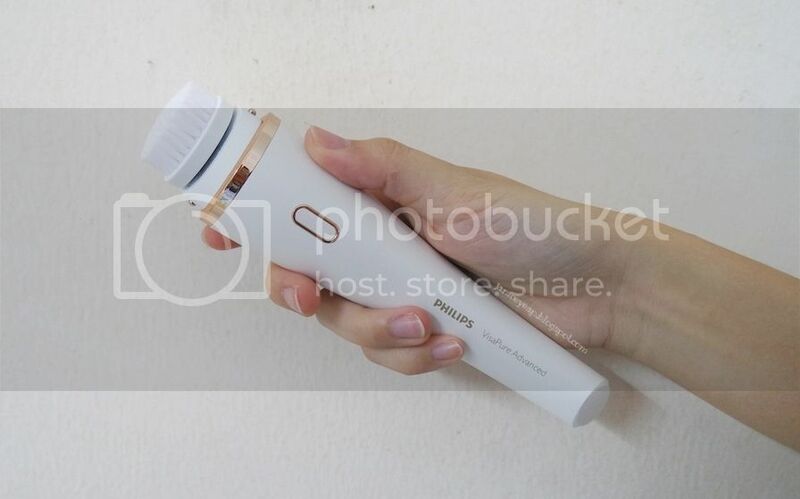 Not sure if you guys remember from my previous post that I have blogged about the new skincare tools which was launched by Philips. 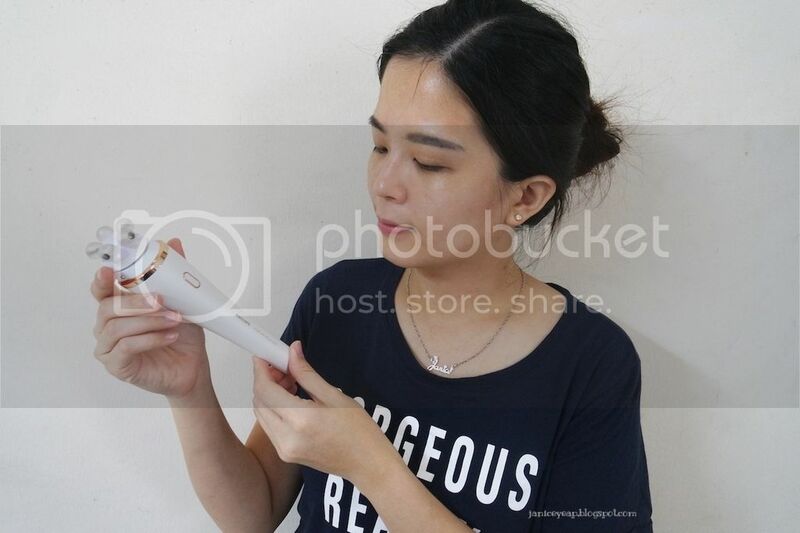 You may find the link of the post here: http://janiceyeap.blogspot.my/2016/07/philips-introduces-new-line-of-advanced-skincare-tools.html. The Philips VisaPure Advanced aims to bring the salon experience into the home, elevating the results of women's beauty regimes through advanced technologies. 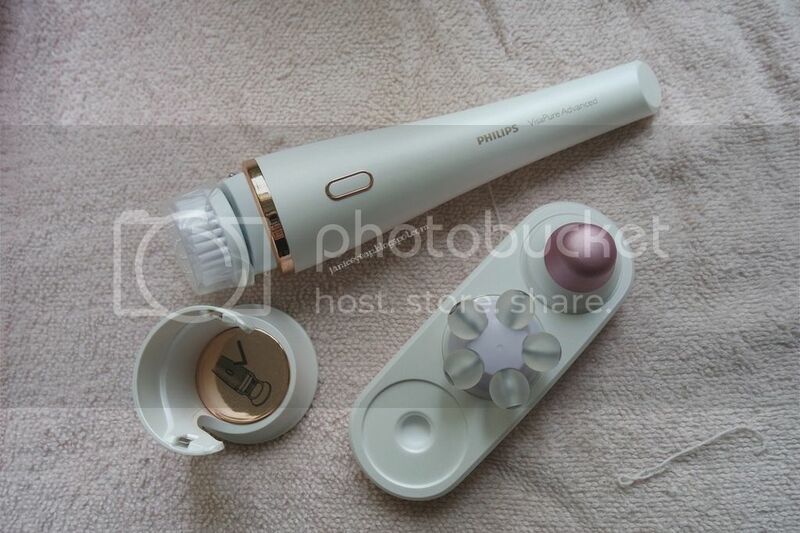 Best of all, this Philips VisaPure Advanced comes with three sets of brush heads - Cleansing, Revitalising Massage and Fresh Eyes that can be easily integrated into the skincare routine. VisaPure Advanced is equipped with Customised DualMotion technology whereby each head that comes with VisaPure will have specified levels of rotation and vibration. Both the handle and the new attachments are equipped with an innovative NFC tag that enables the advanced Intelligent Head Recognition. This means that the handle immediately recognises the specific head once put on. You will then hear a beep and the intensity settings indications flash alternately. The tool then activates a customised program for the head attached. 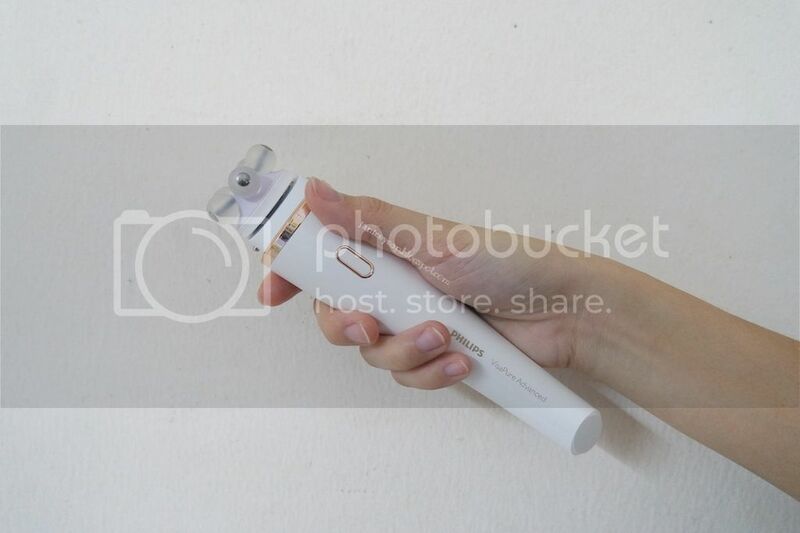 In this way, we can enjoy dedicated programs of Customised DualMotion technology for different skincare benefits. Anyway, let me start off with review of the Cleansing head. With this brush head, cleansing face routine becomes so much easier. This cleansing head can be used together with any cleansers you wish to use. With this deep gentle cleansing head, we can have 10 times better cleansing by hand but just as gentle. With the 17000 ultra fine bristles, it helps to remove more make up residue and dead skin cells and dirt which can clog pores. I tried this on my face full of makeup and surprisingly, all the debris and makeup were completely removed from the face. Makeup debris left on the brush. I forgot to take photos of the clean wet wipes which I used to wipe my face after cleansing my face using the Cleansing head. The brush on the other hand is rather gentle when I touched it with my fingers or placed it on my face. 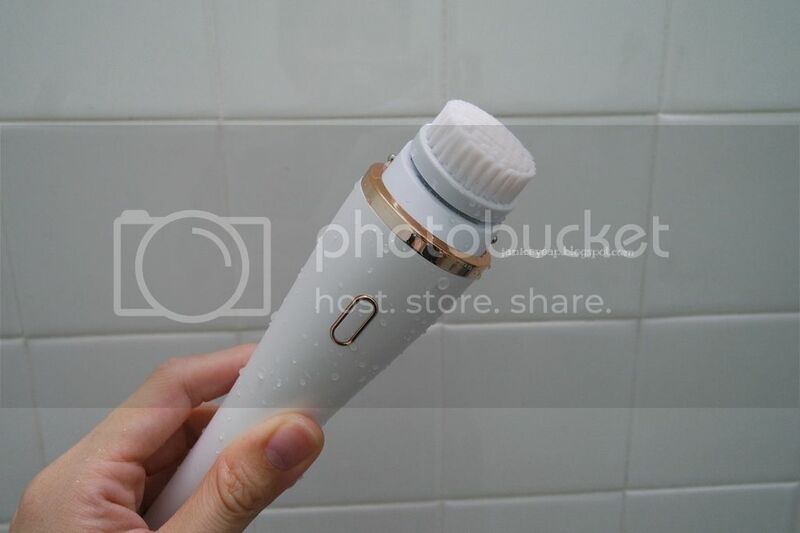 Oh ya, did I tell you that you can also use this tool during the shower?!! There are 2 Intensity Settings depending on your personal preference during cleansing. Intensity setting 1 is for a gentle treatment while the Intensity Setting 2 is for an intensive treatment. If you are a first-time user, I would suggest to select Intensity Setting 1. If you do not experience any skin reactions, you can proceed to use the tool at Intensity Setting 2. However, I personally find that Intensity Setting 1 is good enough to cleanse my face. The cleansing program consists of 3 treatment period of 20 seconds. Each period has a specific rotation direction related to the skin zone. For optimal performance, start on the right/left cheek (whichever you prefer) and switch to the left/right cheek after 20 seconds. Use the last 20 seconds to treat the forehead. Other than that, you can also use it for cleansing the neck and décolleté. However, try not to use on the sensitive skin area around the eye and remember NOT to overdo the cleansing and do not cleanse any zone longer than 20 seconds. I noticed each time I used this to cleanse my face, my face is visibly softer and cleaner. My skin does not feel dry at all even though I use it for almost every day. Next up to apply toner / lotion after cleansing. 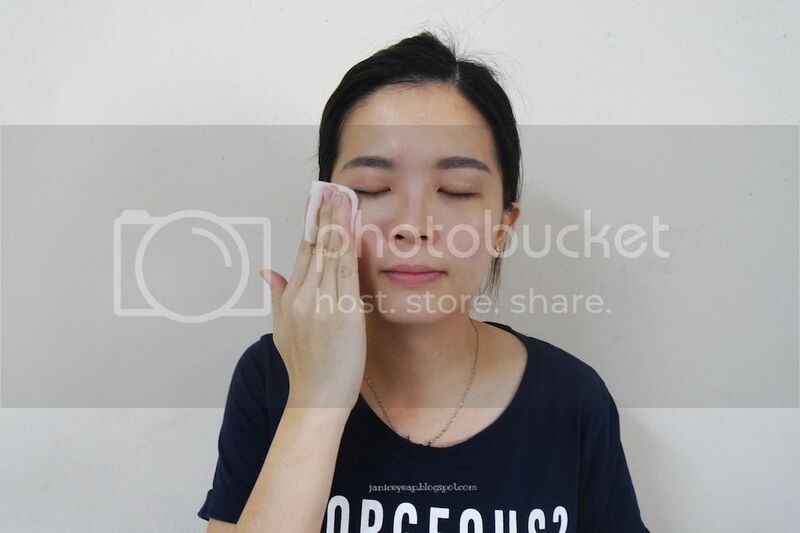 I can switch the Cleansing head to Fresh Eyes head after the toner. When you attach a different head the tool recognises it. You hear a beep and the intensity setting indications flash alternately. The Fresh Eyes head with its customized DualMotion program delivers 120 nano-vibrations per second, gently massages the skin below the eye. The premium coating gives a cooling and refreshing experience: a boost of freshness for tired eyes in only 30 seconds. Apply eye cream / serum before using Fresh Eyes head. 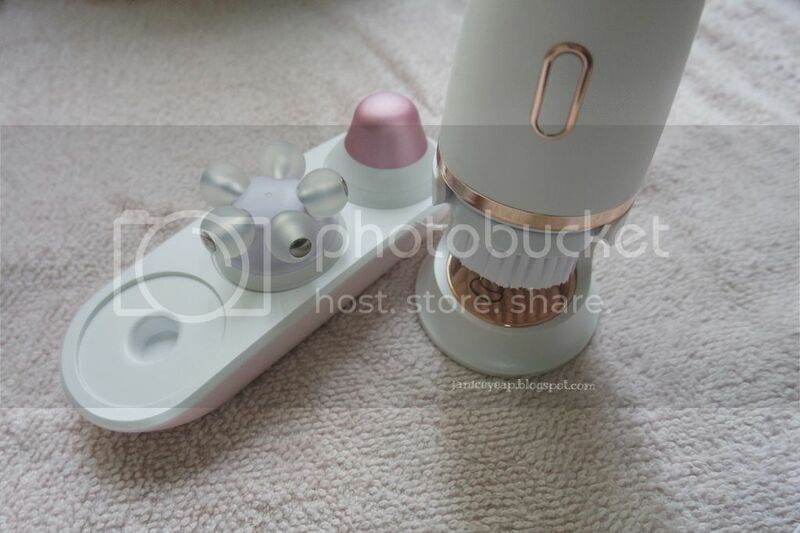 It consists of 2 treatment periods of 15 seconds which has 2 intensity settings: Intensity Setting 1 vibrates, Intensity Setting 2 vibrates and rotates. Always start below your right / left eye and when the tool pauses after 15 seconds, move to the area below your left / right eye. This Fresh Eyes head is suitable for all skin types. It is intended for use on the bony area below the eye. Try not to place the Fresh Eyes head on the eyeball or on the eyelid. 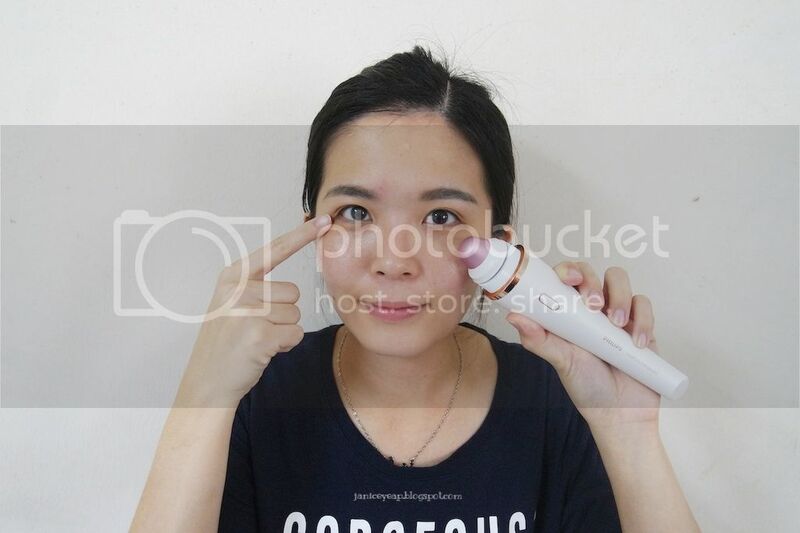 Do not push the head too hard onto the skin to make sure the treatment remains comfortable.After 15 seconds, the tool pauses briefly to let you know that you have to move it the area below the left / right eye. When the program is finished, clean the Fresh Eyes Head with water and mild soap. Overall, this Fresh Eyes head gives a cool sensation feeling when the tool is placed around the eyes. Use it once a day in the morning for fresher eyes. A good routine to kickstart the day. *winkz* I noticed that the cream absorbs pretty well around the eyes area too after using the Fresh Eyes head. Next up would be using the Revitalising Massage head. The revitalising massage head is designed together with experts in Japanese massage. The customised DualMotion program gently stimulates the skin to encourage the blood flow and relax the muscles. By encouraging the blood flow, more oxygen and nutrients are available in the skin, making your skin look radiant, revitalised and giving it a healthy glow! This Revitalising Massage head is intended to massage the cheeks and is suitable for all skin types. It is advisable to use 2 - 3 times a week. 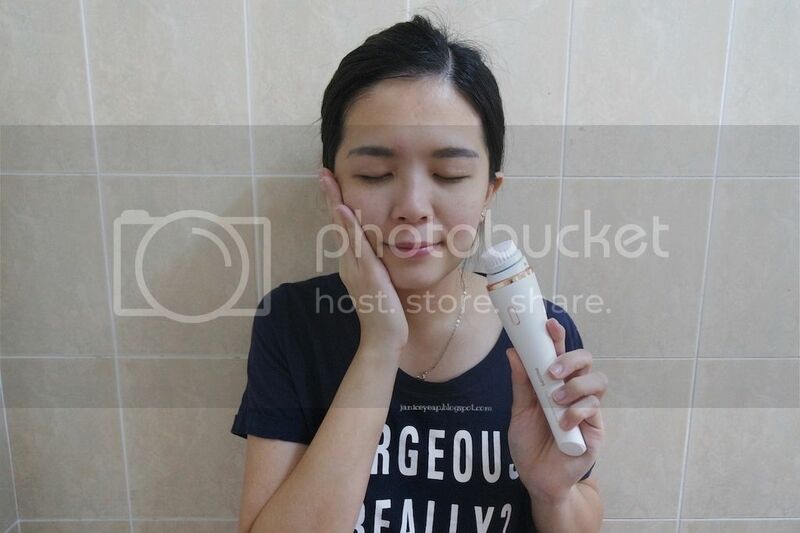 Of course before you massage the skin, it would be best to cleanse your face with the Cleansing brush head. That's not all, use the revitalised massage head on dry skin or after applying cream (i.e moisturiser) or oil to your skin. It consists of 2 treatment periods of 1 1/2 minute. The revitalising massage head is intended to treat the right and left cheek. The cheek zones include the chin, the area between the nose and upper lip and the areas between the eyes and ears. Do not use the Revitalising Massage head on the sensitive area around the eyes. The massage is feeling good. Each time when I massage my cheeks with the Revitalising Massage head, I feel refreshed as if I had just undergone a facial massage by the beauty therapist from the beauty centres. On the other hand, try not to apply too much pressure on the skin while using the tool as it will cause some discomfort on the face. 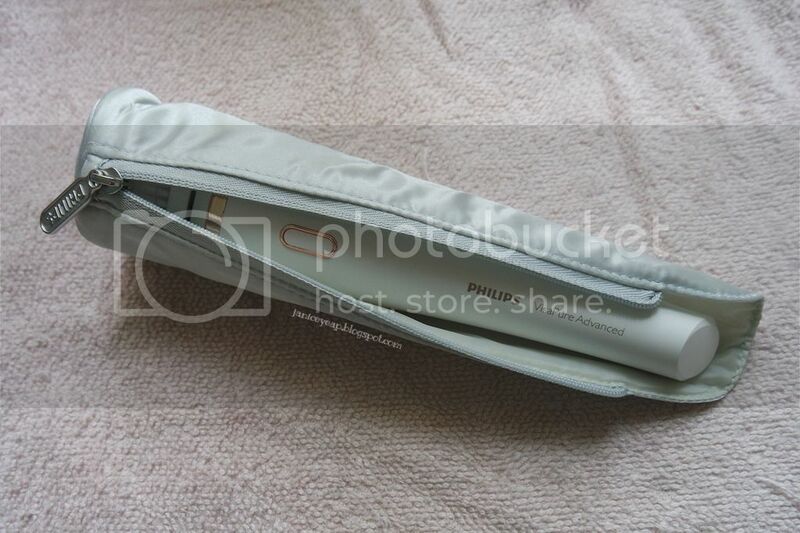 I also love how this Philips VisaPure Advanced comes with a travelling pouch which conveniently allows you to carry around when you are travelling. There's also a battery indicator to indicate the battery life. When the battery is almost empty, the charging light flashes amber for 15 seconds. The battery still contains enough energy for a complete treatment. You can use the charging stand to charge the tool. The charging light flashes white to indicate the tool is charging. A fully charged tool can be used at least 2 WEEKS WITHOUT CHARGING. The only drawback is that the tool needs to charge for 6 hours before it is fully charged. Amber light indicates that the battery is almost empty. 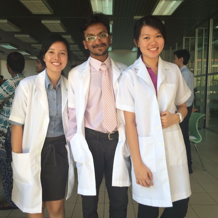 Overall, I am satisfied with Philips VisaPure Advanced and in fact I am loving it to the max. I carried it with me almost everywhere I go especially when I travel to outstation for work. It seriously benefits me a lot from the goodness of the tool itself. With 3 heads provided, definitely this is a good investment for the ladies who can have 3-in-1 benefits from this tool. With VisaPure Advanced, I can now enjoy a range of benefits to reveal a radiant, revitalised and refreshed skin. Philips VisaPure Advanced is sold at RRP RM1399 and it is now available at the following selected Sephora outlets: Suria KLCC, Paradigm Mall, Sunway Pyramid, Midvalley Megamall, IOI City Mall, KOMTAR, Johor Bahru, Gurney Paragon Penang and Imago Kota Kinabalu. 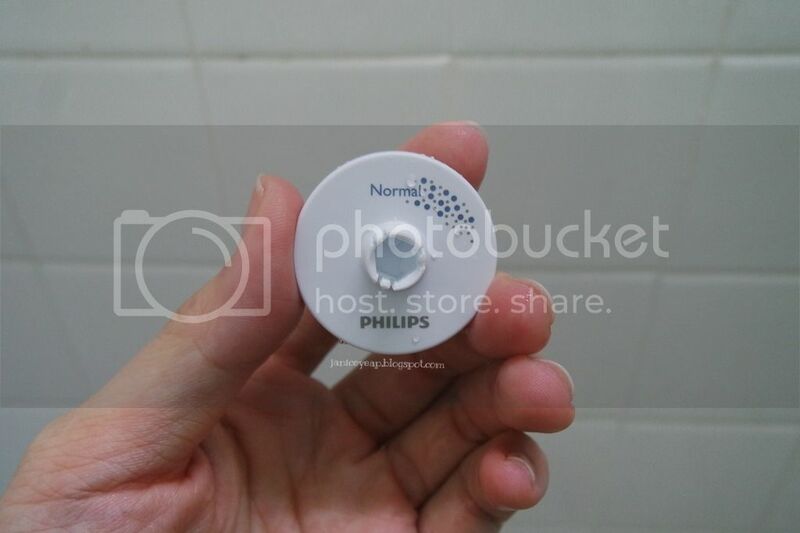 For more information, please visit www.philips.com.my. Disclaimer: Photos taken above are not edited and the tool was sent to me for review purposes. However this does not affect my judgement in the review in any way and all opinions expressed are solely my own.